Last week the long awaited United Nation’s report into the assassination of former Lebanese president Rafik Hariri was made public. While the report shied away from casting direct blame on Syria’s president Bashar al Assad, it leaves no doubt that there was direct Syrian involvement in this horrible crime. The report recommends further investigation which requires the assistance of the Syrian regime. This seems very unlikely. This is possibly the last straw for the United States in a long list of Syrian delinquency. These include graciously hosting numerous Palestinian terrorist groups including Hamas; continuing to support Hezbullah, stirring up trouble on Israel’s northern border and providing a conduit for terrorists seeking to cause destruction in Iraq. Speculation is rife that America will bring Syria before the Security Council for its continued bad behaviour. There is a very real possibility that economic sanctions will be imposed. While I whole-heartily support the international community’s (really the West’s) intentions to punish Syria, history has shown that economic sanctions are not an effective tool. Saddam Hussein’s evil regime survived quite comfortably under a decade of international sanctions. Rather it was the innocent Iraqi people who bore the economic hardship. Thus a more effective policy in the form of regime change is required. Not only is the Syrian regime a threat to its neighbours, Iraq, Israel and Lebanon but he is also a menace to his own people. Although Syria has a constitution that in theory should protect the rights of its citizens, a state of emergency has been in place since the 1960’s effectively giving the government absolute authority. More than 4 decades of martial law has reduced Syria to one of the most unfree countries in the world. According to freedom house, an independent organisation that monitors freedom around the world, on a scale of 1-7 from free to unfree, Syria scores a whopping 7. It has no free press, no real opposition parties and uncontested presidential elections. Moreover like most totalitarian regimes the Syrian government from time to time murders any potential political opponents. In fact last year 30 Kurds were killed in cold blood by security forces for staging a protest against the government. Dictatorial regimes like Mr Assad’s need more than a slap on the wrist to encourage reform. The only way to deal effectively with them is expulsion. ‘Well you might ask who will replace Assad? Maybe they will be worse. A weak Assad promotes stability.’ I acknowledge these concerns. Unfortunately the American military is stretched to capacity in Iraq and it seems very unlikely that Europe will shoulder the burden of a long term Iraqi style occupation of Syria. So the only option is an internal coup. Last week a liberal Israeli newspaper reported that some high ranking members of the Syrian armed forces had approached the Bush administration about a possible over-throw of the Assad regime. (These reports were subsequently denied by Syrian army officials.) I do not think this is the type of regime change that the international community should support. Syria needs a people’s revolution like recently happened in Lebanon and the Ukraine. This type of regime change and democratisation will be a slow process. It should be managed as follows: First the international community needs to find dissentients who support the idea of a free and democratic Syria. Secondly money and public support needs to be given to these people. The Syrian people need to see them as a credible alternative to Assad, the Islamists or the military. Thirdly Assad’s monopoly on information needs to be smashed. The Americanw could set up an Arabic language radio station from Iraq to promote the spread of democracy in Syria and expose the brutality of the Assad regime. Lastly Arab public support for the end of Assad’s rule is vital to give the potential democratic revolution in Syria legitimacy. The international community and particularly America must make it clear that our ultimate policy for Syria is regime change. The wave of international terror since 9/11 has shown us that appeasing dictators in the hope of creating stability only creates more violence. This report poses an incredible opportunity to strike another blow against tyranny and terror in the Middle East. Now is not the time to retreat from the new neoconservative foreign policy. Iran is frantically pursuing nuclear capabilities...for purely peaceful reasons of course. But the presence of two key figures — a prominent Iranian lawmaker and a member of the country's elite Revolutionary Guards — lent the meeting more legitimacy and was a clear indication of at least tacit support from some within Iran's government. Since that inaugural June meeting in a room decorated with photos of Israeli soldiers' funerals, the registration forms for volunteer suicide commandos have appeared on Tehran's streets and university campuses, with no sign Iran's government is trying to stop the shadowy movement. Samadi claimed 30,000 volunteers have signed up, and 20,000 of them have been chosen for training. Volunteers had already carried out suicide operations against military targets inside Israel, he said. Do you trust Iran when they say that they won't produce nuclear weapons? Strangely, this story didn't appear in the local papers today. So, why the fuss about this small piece of land? (c) The Heights control the main water sources of the State of Israel. UN envoy to the Middle East Terje Roed Larsen reports that Assad is ready to resume the peace talks with Israel "without conditions". I won't be expecting too much from the "without conditions" statement. It's similar to how Assad's father first demanded "full withdrawal" as a basis for agreement, only to change his tack when he saw the Israelis were willing to do business - pocketing any concessions and using them as a point of departure rather than a point of conclusion. The initial talks between Rabin and Hafez Al-Assad were based on "full withdrawal" from the Golan Heights. As Rabin moved closer towards Assad, Assad stepped further away. Assad later defined "full withdrawal" to mean full withdrawal to the 1967 lines. To Rabin "full withdrawal" meant withdrawal to the international border, and not the June 1967 lines. What was the difference? The international border is the mandate border from 1923. It therefore reflected the original border between Israel and Syria. The 67 lines didn't exist on any map. They represented the positions of the two sides on the eve of the 67 war. The difference between the two lines resulted from the war of independence in 1948. By 1949 the Syrians had captured some Israeli territory to the west of the 1923 lines. As part of the armistice agreement Syria withdrew from these lines and returned to the international border, making these demilitarised zones. The actual difference between the two lines was a mere 66 square kilometers, but for the Israelis that area affected their ability to control the east bank of the lake Kineret - their major source of water. Syria wanted it both ways - they wanted Israel to withdraw from territory captured in 67, but were refusing to allow Israel to return to the territory that they controlled as per the international border. The negotiations carried on without much success. Eventually Israel moved closer to the Syrian demands. Israel eventually agreed to withdraw on the basis of the 67 lines, as long as they could get a couple of hundred meters off the coast of Lake Kineret. The negotiations eventually ended in early 2000 when Assad refused to even listen to an amazing proposal from Clinton of what Barak could accept. 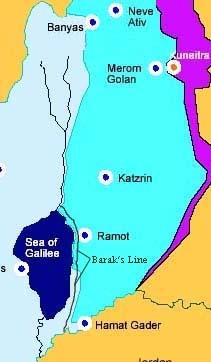 Barak was willing to withdraw on the basis on the 67 lines as long as he had some territory to the east of the Kineret shoreline. In detailing his offer, Barak drew a line on a map that was just to the east of the Jordan river, and south of it he drew a line off lake Kineret - " a few hundred meters off the shoreline." He was prepared to compensate moving the border (from 67) in the north slightly east by moving the border in the southern part of the lake slightly to the west. Assad would therefore still end up with more territory than the international border stipulated. The following map is my representation of the line drawn by Barak. As you can see, the line I drew in is to the west of the line in the south, and to the east of it in the north. This allowed for the sum total of territory that Syria would receive, to remain exactly as Assad demanded. The proposal in 2000 was made in Geneva. Clinton started the presentation with what he thought would be an easy point, in order to gather momentum. He detailed that Israel had finally agreed to Assad's demand - full withdrawal to the June 1967 lines based on a "commonly agreed border." Assad's reponse surprised even right wing Israelis. He immediately said "this is a problem." June 1967 was Assad's mantra, this is what he repeatedly sought, and yet now he was objecting. Was he objecting that the border would be "commonly agreed?" Dennis Ross points out that the language Clinton proposed was the exact language used as a demand by the top Syrian negotiator in earlier talks! Thus the Syrian-Israeli talks came to an abrupt end. I fully support Sharon's stance on this issue - that Syria must first show that they are serious by cracking down on the terrorist training camps on Syrian soil, as well ending their role as a channel to funnel arms from Iran to Hizbulla. Until the Arab world accepts Israel's moral legitimacy negotiations will be futile - only then will Arab leaders be able to justify compromises. For an account of the Syrian Israeli talks see this Daniel Pipes review. Cartoon from Cox & Forkum Editorial cartoons. Caroline Glick from Jerusalem Post has written another excellent piece on how to deal with Iran. Just last week Iran rejected calls from the IAEA to cease all uranium enrichment programs. Khatami recently remarked that he will continue with his path of nuclear enrichment "even if it leads to an end to international supervision." This comment was said at a recent parade of the Iranian surface-to-surface Shihab-3 balistic missiles which are code named "Jerusalem." Glick writes about a recent report published by Henry Sokolski. Sokolski heads the Washington based Non-Proliferation Policy Education Center. Previously he was a US arms control negotiator in the first Bush administration. Most significantly – and egregiously – Sokolski recommends that in an effort to check Iranian nuclear capabilities, "Israel should announce how much weapons usable material it has produced and that it will unilaterally mothball (but not yet dismantle) Dimona, and place the reactor's mothballing under IAEA monitoring. Israel should announce that it will dismantle Dimona and place the special nuclear material it has produced in 'escrow' in Israel with a third trusted declared nuclear state, e.g., the US." That is, the primary target of Teheran's nuclear arsenal should respond to the emerging threat by disarming itself. First, it ignores the real danger of Iran using nuclear weapons to destroy Israel, as it has threatened. Second, it ignores the rationale behind Israel's nuclear program: deterring the threat of physical destruction by both conventional and non-conventional enemy forces. It is not simply a deterrent against nuclear attack. To discuss nuclear transparency for Israel without calling for conventional disarmament of, say Egypt, whose conventional armed forces alone constitute a strategic threat for Israel, is to ignore Israel's strategic vulnerabilities. Finally, the recommendation makes no distinction between a nuclear-armed, stable democracy and a nuclear-armed, terror-supporting theocracy. Comparing a nuclear Israel and a nuclear Iran is like comparing a housewife in the kitchen wielding a butcher's knife to a murderer in a dark alleyway wielding a butcher's knife. It is both morally obtuse and strategically blind. Iranian Defense Minister Ali Shamkhani announced on Saturday that a "strategic missile was successfully test-fired during military exercises by the Revolutionary Guards and delivered to the armed forces," adding that Iran was "ready to confront all regional and extra-regional threats." In August, Iran said it test-fired a new version of its Shihab-3 ballistic missile. Israeli sources later said it could reach targets more than 1,200 miles away, or 400 miles farther than its previous range. Top Hamas terrorist Izz al-Din al-Sheikh was killed in a car bomb in Syria on Sunday. While not confirming nor denying involvement in Khalil's death, Israeli officials said he was involved in the transfer of arms from Syria and Lebanon to Hamas hands in the Palestinian territories. Security sources said Khalil, while not as well-known as Hamas political figures, was very closely linked to Hamas cells in the West Bank and Gaza Strip. They also said he gave the orders for the double suicide bombing attack in Beersheba on August 31 that killed 16 Israelis. Izzadin Kassam, Hamas's armed wing, vowed to avenge Khalil by attacking Israeli targets overseas, the group said in a statement issued in the Gaza Strip. "We have allowed hundreds of thousands of Zionists to travel and move in capitals around the world in order not to be the party that shifts the struggle overseas. But the Zionist enemy has done so and should bear the consequences of its actions," said the statement, a copy of which was faxed to the pan-Arab news channel Al-Jazeera, which broadcast the message. The Middle East Intelligence Bulletin has a comprehensive report on Syrian terror enablement. Since the mid-1990's Damascus has been the operational headquarters of the Hamas military wing and a nexus for the transfer of external funds to Hamas operatives in the territories. Syria and Syrian-occupied Lebanon have become major conduits for funneling weapons and explosives to Hamas and safe havens for training hundreds of its operatives... most of the deadly Hamas suicide attacks [of 2001-2] have been linked to Damascus. Visit HonestReporting for a special report that provides a great overview of Syria's involvement in terror. "In early 1990 one of the American newspapers cited a Saudi diplomat as saying that his country saw the growth of Iraqi military power ... as a source of worry. "[Following this statement] the Iraqi government generated a commotion by claiming that its power is always [directed] against Israel and will always be so. Saudi Arabia was obliged to distance itself from the [diplomat's] statement. A mere few months after this episode, the entire world witnessed the Iraqi forces invading the city of Al-Khafji in Saudi Arabia after having completely taken over her sister country and ally, Kuwait. "Today Iran is saying the same thing, that its nuclear arsenal and its improved missiles are directed [only] against Israel. [This statement] plays on our emotions so that we will think that anyone who waves the banner of confrontation with Israel will be forgiven all his sins, deeds, and intentions, without any careful scrutiny of his public promises. "Iran is of course in a state of conflict with Israel as a result of its solidarity with the Palestinian problem, its support for Hizbullah [in its fight] against the former Israeli occupation of southern Lebanon and what is left of it today, [and] its support for Syria for the same reason. After an article published by the Mail & Guardian which listed "the Death Penalty" as one reason why we should boycott America, you can imagine my surprise to see that they did not report on this story.